Markets did not break down in the second week of our lunar Red period, and even recorded new highs. This is a sign of ongoing strength. What does that mean going forward? The market has closed right near the overhead resistance. That means it will not be easy to add to the recent gains, unless we see a proper breakout to the upside. The new lunar green period favors a move to the upside. The question will be: is there enough fuel left in the tank to move even higher, and more importantly: hold on to whatever gains we get? My Earl indicator (blue line) is bottoming, indicating that there is now room for another push to the upside. But the Earl2 (orange and red line) remains bearish. This means any new push to the upside could be quickly reversed. So, I am going to remain cautious. 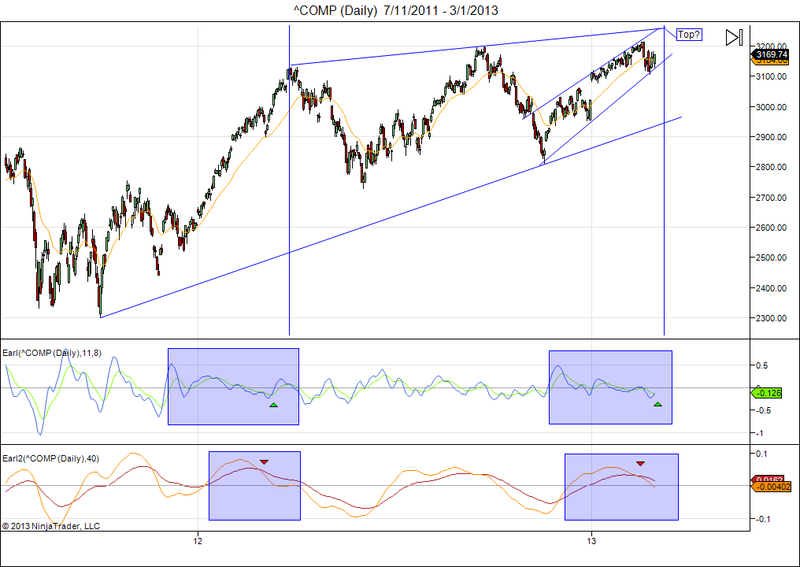 The trend is still up, but I would now keep my stop-loss at 3225 for the Nasdaq. Any drop below that level would break the uptrend, and probably signal the start of a larger move to the downside. What could trigger a downturn? Well, among many other things I would watch out for solar flares this week. A few weeks ago, we had a post about Watching solar activity. Watching for potential solar flares is equally important, because solar flares cause geomagnetic storms, which are known to have a negative effect on stock markets. That’s why we keep a solar flare monitor on our Solar Activity page. I watch it every day before the market opens. So what to look for? First thing to know: the sun has a slow 27 day rotation period, and sunspot areas move from left to right in the picture. Most sunspots are harmless, but bigger sunspot groups can release solar flares, including the rare and dangerous X-class flares. So, when a big sunspot group becomes visible at the left of the picture, then we know it will come near the middle of the picture after about 7 days and then it will be pointing right to us. If an X-flare happens when our planet Earth is right in the “crosshairs”, then a massive geomagnetic storm occurs. This can knock out satellites and cause blackouts. The stock market usually doesn’t respond well to X-class flares (probably because of the risk for economic damage). * March 6, 1989 storms: S&P 500 dropped 2% over the next two weeks. * Juli 14, 2000 (Bastille Day Event): S&P 500 dropped 100 points (~6%) in the next two weeks. * Oct 19, 2003 (start of Halloween Storms): S&P 500 lost 30 points (~3%) in one week. The most recent X-class flare that came our way was on October 24, 2012 and the S&P 500 lost 60 points (~5%) over the next two weeks. The market doesn’t always lose 100 points, but usually there is some effect in the market after an X-class flare. The good news is we have tools to anticipate when X-flares might come our way. 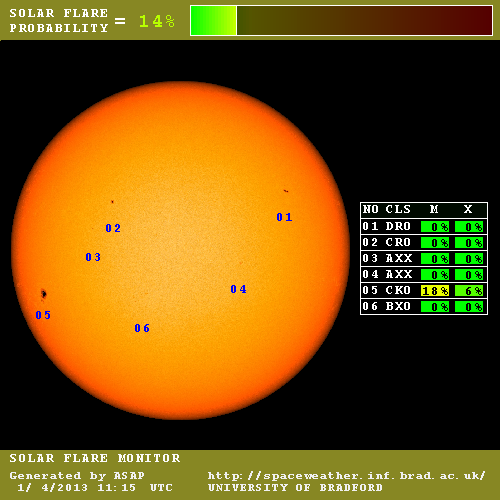 As you can see in the current flare monitor picture (above), a big sunspot area (number 05) has appear on the left side. The table on the right shows you that this is a dangerous sunspot group. The risk for M-class flares is 18% and the risk for X-class flares is 6%. As this group will probably remain in view for another 10 days, we better keep an eye on it. Sunspots high – sell or buy? One reader pointed out that the actual sunspot peak can come anywhere between 3 and 5 years after the start of the cycle, and is thus not very visible in the charts that we presented. That’s a fair criticism, and I have now generated another chart that makes the market activity before and after and solar peak much easier to see. I have used the Dow Jones Industrials average and the months of maximum SSN (smoothed sunspot number) have been derived from http://sidc.oma.be/sunspot-data/. Nineteen solar cycles were considered in this study. By normalizing all sunspot peak months to 1, it becomes very easy to see whether the market went up into the solar peak, and we also see what happened in the 12 months after each solar peak. We can see it is very much a mixed bag. In 8 cases the market went down in to the solar max, in 9 cases the market rose into the solar peak, and in 2 cases the market was breakeven. This is comparing the Dow Jones at sunspot peak versus the Dow Jones 1 year before it. If we look what the market did in the 12 months after the sunspot max, we see 8 cases where the market went up, 8 cases where it went down, and 3 cases that were breakeven. Is there perhaps some connection between what happens in the 12 months before and the 12 months after? 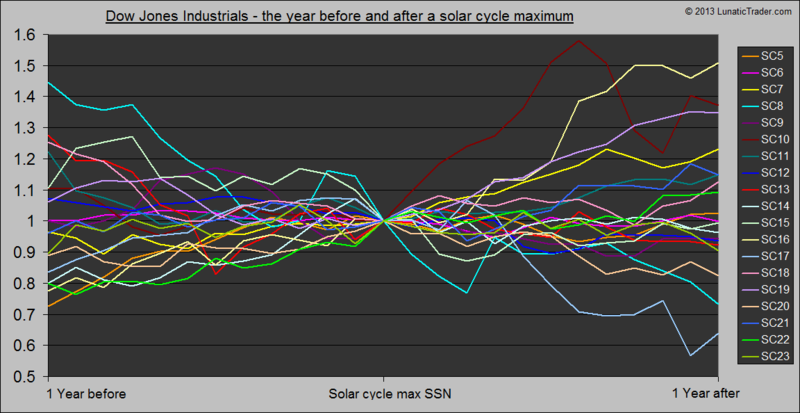 If we look at the eight solar cycles where the market declined into the solar peak, then we find that the market subsequently turned up on 4 occasions, it continued to go down in 3 cases, and was flat in 1 case. If we look at the 9 cycles where the market went up in the year prior to a solar peak, then we find that the Dow Jones turned down in 4 cases, it continued to go up in 4 cases, and it went flat in 1 case. Basically, the solar cycle peak does not help us to decide whether we should sell or buy, regardless of what happened in the 12 months prior to the sunspot peak. Half of the time the market reverses direction, half of the time it doesn’t reverse direction. There is also no obvious recurring pattern from cycle to cycle. Volatility has increased last week, but stocks continue to look on the upside. With a new lunar green period now underway, the market is set to challenge for new highs again. Notice the similarity with the market setup we had in early 2012 (blue boxes). Last year the market rallied for another two weeks after the Earl index turned up (green arrow), and then went into a significant decline, as the Earl2 continued to point down. 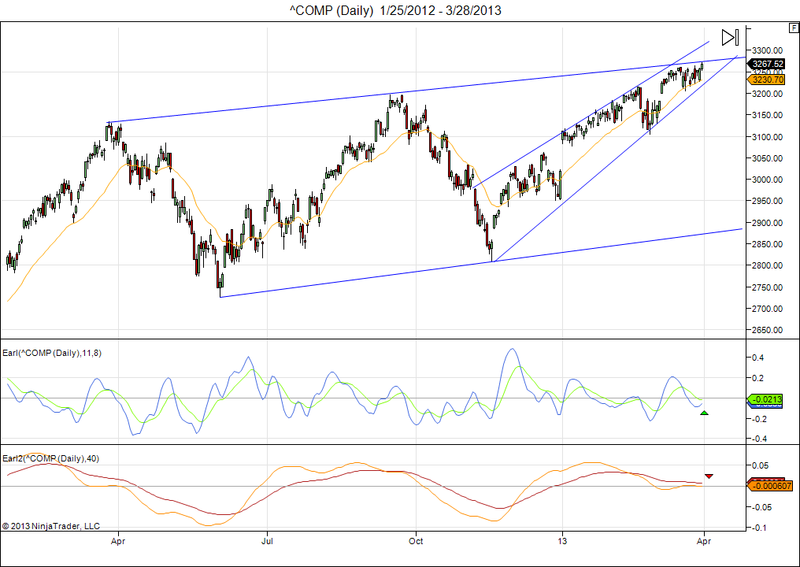 If the Nasdaq rallies to 3250 by mid March, then I would take profits or buy some protection with put options. I think we will be entering a down to sideways period. 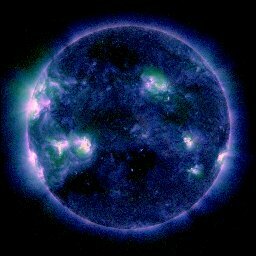 You may have noticed the solar activity widget in the sidebar and the Solar Activity page in the main menu. These pages can be used to monitor daily sunspot numbers. This is quite important if you are a daytrader. And if you are using our lunar periods then it is good to keep an eye on them as well. The stock market tends to have down days when the sunspot number suddenly jumps up from low levels. Especially spikes above 150 are generating fear. Typically, the markets will recover the losses when the sunspot count goes back below 100 again. A typical example was seen a few weeks ago. The sudden market drop on February 20th came with a very fast growing sunspot region that appeared within days (see article link below). This will change however when we approach the solar cycle peak. When the SSN goes consistently above 120 most of the time, then the sudden spikes above 200 tend to move the market up with new optimism. So, instead of bottoms you then get market peaks on days of very high sunspots. A smart trader can use sunspot information, but how can you known whether sunspots will go up or down tomorrow? One of the pictures shown on our solar activity page can help you to see whether sunspots will ramp in the next days. The bright spots show you the very active regions where sunspots appear. The key thing to understand is that the sun rotates slowly (27 days) and new sunspot areas come in from the left side, while currently visible sunspot areas will move away on the right side. You can even watch some of the videos on The Sun Today, and then you will never forget it. So, whenever you see very bright spots and a large white corona on the left side edge, you can tell that very active solar region (and thus more sunspots) is ready to become visible for us in the next couple of days. If there are very bright areas on the right side, then we know they will disappear from view within a couple of days (and thus sunspots more likely to go down). For today you can see that the left side is showing very bright compared to the right side, so it is likely that new active sunspot zones are about to come into view. Once the market becomes very solar-sensitive, it is good to check the solar activity every day, and be prepared accordingly.